First of all Happy Holidays to all! Thank you for the very nice comments on the mountain! 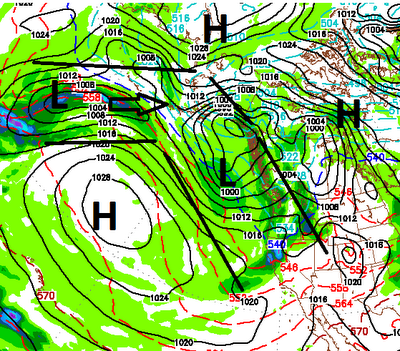 Now back to business; A well advertised storm will be moving in tomorrow night. The squeeze is on again as blocking ridges of high pressure will force that storm down through our area. Unlike the last storm, the exit door is wide open so we will not get 4 days of heavy snowfall. Here is a look at how things will shape up tomorrow. I actually talked about this one in the beginning of the month. 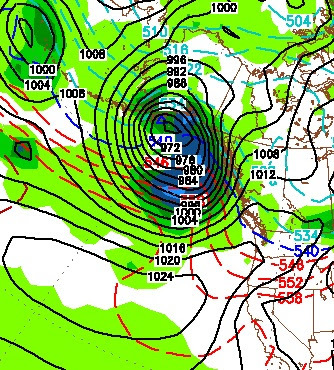 In my last post I mentioned that this storm will have a more profound affect south of Lake Tahoe. That is still the case. 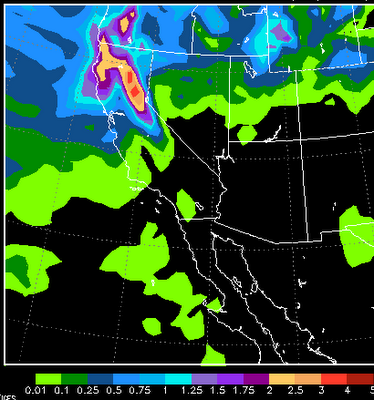 However, I do expect a foot of snow for the Northern Tahoe Sierra and Carson range by Wednesday night. 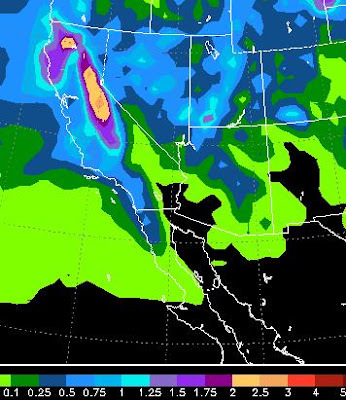 I do not see any major precipitation events after this next storm for 2-3 weeks. We are going to dry out. 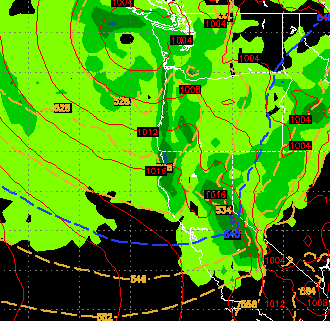 We may have a weak storm come into the area New Years day, but the models are picking up on a long dry period. This storm will have a greater impact in South Lake Tahoe area but will deliver 2-4 feet of additional accumulation for all of the Sierra around Tahoe. I believe Slide Mountain will pick up an addition 18-30 inches in the Carson Range. This storm will continue until tomorrow afternoon. There will be a quiet period tomorrow night. For those of you looking for cold weather, it will be very cold Christmas Eve night. Forecast from prior posts are right on. 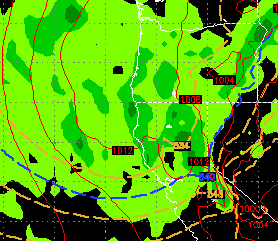 The next big moisture plume should arrive late morning early afternoon. Then another tomorrow morning. Snow amounts will be in the 4-8 feet range. Much of it depends on where you are. I am still looking at 4-5 feet for Slide Mountain with very good coverage down to the Washoe Valley. The valley forecast from last post is close, but it appears I may have underestimated the amount of snow. I am now looking for 1-3 feet for the foothills above 5,500 feet and up 6-12 inches for the valley floors. In addition, the storm for the 27th is still looking good with another 1-2 feet for the Tahoe resorts. It appears the heaviest snow may be the south side of the lake down to Mammoth. I will talk more about this storm tomorrow. The storm is currently approaching from the Northwest with the first wave of moisture due later this morning. 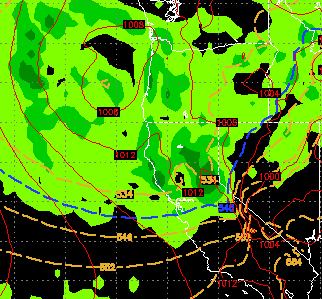 Here is the NAM weather model for total precip up until Monday. The models are starting to increase the amount of precip coming. This forecast is talking 8 inches for NW side of Tahoe and 4-5 inches for the entire Sierra around Tahoe. 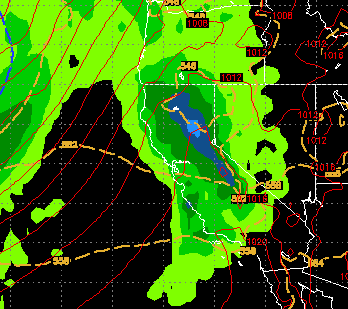 I believe lake level will pick up at least 2 feet of snow while the Sierra above 8,000 feet can expect 4-8 feet. The Carson Range should be in the 4 foot range by late Monday. For more details about the storm see my post from yesterday. Reno and Carson City will also see snow. Very difficult to forecast. The foothills above 5,500 feet should have a pretty decent snow event (12+ inches), while the valleys should pick up 2-6 inches. Again very difficult to predict how much of this makes it over the mountains. I am much more comfortable forecasting Sierra snowfall amounts. I sound like a broken record, but the snowy pattern is going to continue. The first of two very large storms is knocking on the door right now. It will bring very windy conditions this afternoon into this evening. Wind prone areas of the eastern foothills could easily see 70mph winds. By tomorrow the precip moves in. 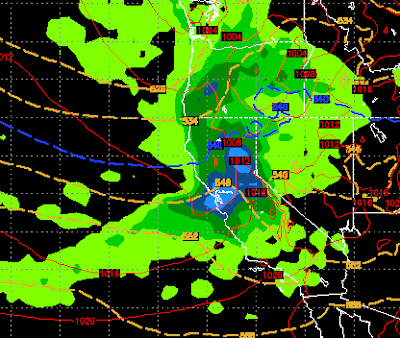 This storm is moving very slowly, so the models are predicting a major snow event for the Sierra and Leeward Valleys. 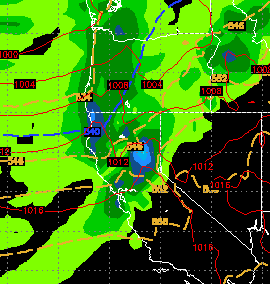 It is going to snow in the Sierra, non-stop, from tomorrow morning through Monday afternoon. Much of that snow will be very heavy at times. Here is why, notice the blocking that is occurring forcing the front to remain stationary, remember to click on an image to enlarge. Needless to say, mountain travel this weekend should NOT be attempted! Also with the copious amounts of snow on a very solid base, avalanche dangers will be high and you should check the Sierra Avalanche site. A link to that site appears on the right side of this web page. I apologize for my absence. I have been very busy with my day job and since the weather has been tame there was no need to blog. However things are changing. Starting with a nice little storm for Tuesday, Wednesday and Thursday. Tuesday will usher in some winds while Wednesday will bring precip. Wrap around moisture could be on tap for Thursday and this is a much cooler storm and will be all snow. 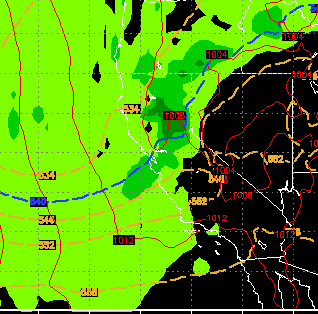 As the cold front comes through on Wednesday, snow levels will drop to the valley floors. An area of wrap around moisture could affect the 395 corridor south of I-80 with up to 6 inches of snow late Wednesday into Thursday. The dangerous winds for the Sierra Foothills on the leeward side will remain in effect. However, the NWS is now talking about those winds being strongest well south of Reno. My original analysis was for the possibility of 100mph plus winds in wind prone areas like Arrow Creek. I think we will see winds up to 100mph but the precip will shield us from the winds going any higher. Those winds will be tonight so hunker down! Snow elevation forecasts now are calling for snow above 7,000-7,500 feet. If this happens, the entire Mt. Rose ski area will be open by Monday as they will see in the neighborhood of 5-10 feet of very wet snow. That is great news, but often times God does not include the NWS in His forecast plan, so keep doing your dances, prayers or whatever else may work. Larger system moves in very early Friday morning. This is a much warmer system that taps into the subtropical jet. Expect damaging winds on Thursday night / Friday morning. This will spill heavy rain into the valley and the NWS is concerned about possible flash flooding. Snow levels will be at 8,000 feet or higher. Where it snows there could be a possible 2-4 feet. 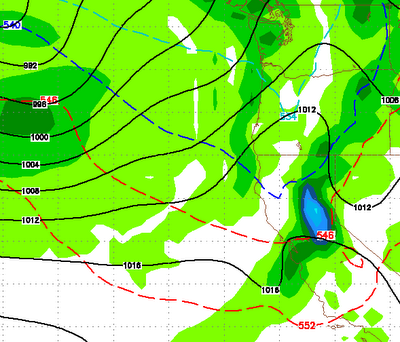 However it looks like this will be rain for most Tahoe areas and possibly half of Mt. Rose too. 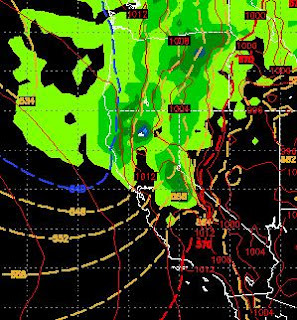 A large storm will pick up ample sub-tropical moisture and should bring very wet weather to the Sierra and Western Nevada. This one is tricky to say the least. As of now, it looks like snow levels could be as high as 9,000 feet for most of this event as the storm taps into a very warm moisture flow from the south. 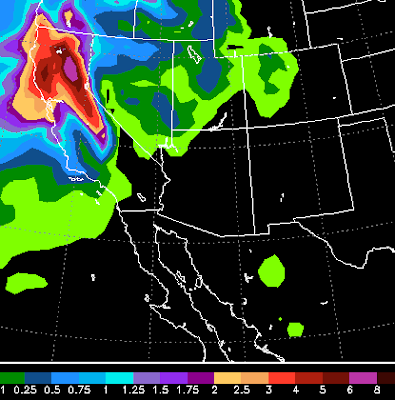 Much of the Sierra could pick up in the 6-10 inch range (liquid precip). If those snow levels could drop down to 8,000, this will build a terrific base in the higher altitude ski areas, like Mt. Rose and Mammoth. The lake level areas like Squaw Valley will see almost all rain on the lower mountain as things look right now. I have charted what is forecast by the GFS weather model for Saturday. 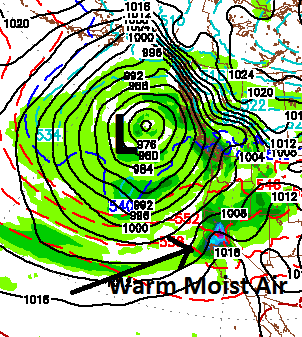 There is a giant storm to our north that is picking up sub tropical moisture from our southwest and bringing that to Tahoe and especially the western crest of the lake. Expect about 6 inches of snow above 8,000 feet. Some of that may be rain. Luckily, this wave is going to hit at the coolest time of the day and hopefully that will keep snow levels down. There is some concern about this last wave making it to Rose. I think it will. This wave will be the last and the most potent from this storm. This storm came as advertised with very high elevation snow. Sven over at Unofficial Mt. Rose, reported on the conditions Saturday (Link to his column in right margin). Many of the Tahoe resorts (all lower in elevation than Rose) saw all rain expect at the very top. Ok, we have been watching this for better than 2 weeks. It really looked like things were shaping up nicely. However, conditions have changed, our alley has significantly widened and unfortunately, as it looks now, the real heavy precip will be moving north of us. You can clearly see the main storm is still north and west. It will continue to send precip our way through Tuesday and possibly longer. Unfortunately, these are very warm storms and snow levels could be in the 8,000-9,000 foot level for most of the event. I think Slide looks like all snow, but other resorts that start around lake level are going to get a health dose of rain up to at least 8,000 feet. What a beautiful run of weather we have had for what seems like forever. With the exception of just a few days, the weather has been pretty nice since the beginning of April. However, who wants nice weather. You can't ski on rocks. I think I speak for many people when I say, "Bring on the crummy weather"! 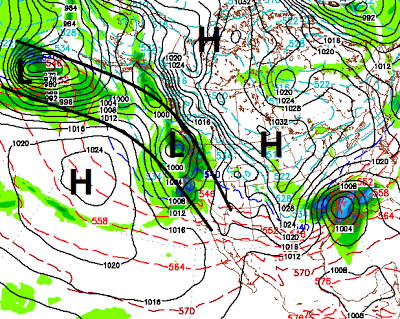 Well, if you believe the EC model, that crummy weather is knocking on the door. If you have not shut down your irrigation system (sprinklers) go out and do it now. That is because it is going to get really cold. Saturday night the low temps will be down around zero in the Sierra (or colder) and low teens in the valley. Our weather is going to stay nice through most of next Wednesday with high's in the 60's and perhaps even a 70 or two. However that is all going to change come Thursday 11/8. Our ridge of high pressure which is keeping our weather very mild is going to get shoved south and west and that will open a corridor for a series of storms. 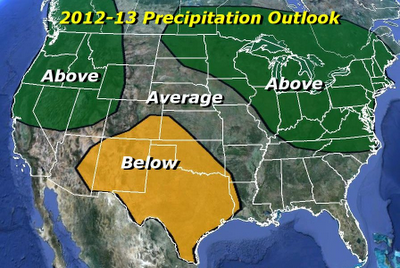 We should enter a stormy period that should bring decent precipitation our way through the end of the month. 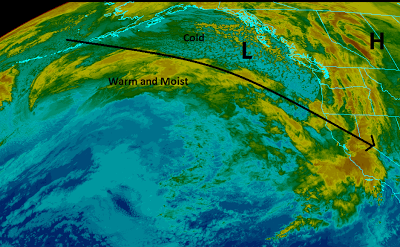 Current We have an impressive front approaching the Pacific NW coast. Unfortunately we have a strong ridge of high pressure that is very dry. These two air masses are going to collide. The result will be the ridge will be weakened as will the front. That means a severely weakened storm will come into our area Thursday and Thursday night. The storm will produce light rain and snow for the mountains with little if any precipitation for the valleys on Thursday and Thursday night. Right now Halloween does not look bad for the trick or treat'ers. Mid-Term Looking ahead, the ridge will build back in and by the weekend through early next week our temps could be 10 degrees above normal so prepare for another shot of Indian Summer. When all is said and done, many mountain areas around Lake Tahoe will pick up 4-6 feet of snow. That should provide a very nice start to the winter. The good news is that this storm was not an anomaly such as a typhoon crossing from Japan. 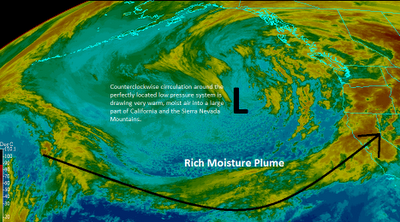 This storm dropped out of the Gulf of AK and picked up ample moisture from the Pacific Ocean and dumped. That is a good sign for the storm machine to start cranking up. 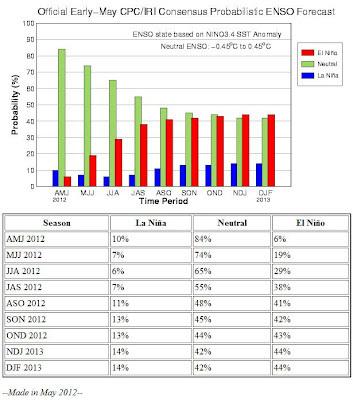 El Nino has weakened and the ENSO outlook is for neutral to weak conditions. About 1/2 the models are saying we will move into a weak to moderate El Nino for the winter of 2012/2013, while the other half are saying we will remain in a neutral ENSO. First of all let me apologize for my absence. I had a death in the family and have been out of town for nearly 10 days. 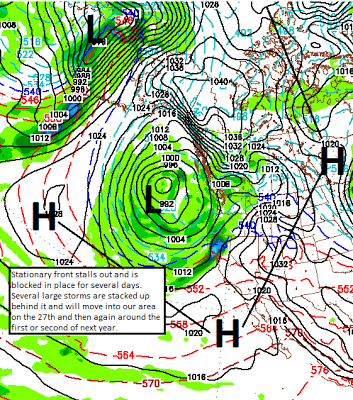 However, had you read my post from the 3rd of October you were warned that a storm was very likely to make it down the coast and hit our area hard (Post From October 3rd) starting today. I must say, getting it right from that far out is the exception rather than the rule especially since I was the only fool talking about it 19 days ago. This storm is packing a very good precipitation punch and areas north and west of Tahoe will pick up in excess of 2 feet of snow at the crest and up to a foot of snow at Lake Level, especially on the north shore. Snow levels are plummeting and snow is falling as low as 5,000 feet which means travel on I-80 is going to be a mess. We have been discussing El Nino since July. However, at that time we moved into a weak El Nino and it has weakened slightly since. However, NOAA is still predicting a moderate El Nino through the winter which bodes well for snow in Tahoe. We have had unseasonably warm and quite frankly beautiful weather through the entire month of September. That is going to change starting tomorrow and you will feel those changes through the weekend. We have a large blocking ridge of high pressure that is keeping what few storms there are, well to our north. This storm is the exception and a piece of energy should break off and give us some very light precip. 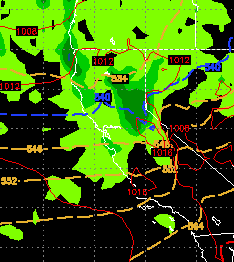 Perhaps a dusting of snow above 10,000 feet on Saturday night. El Nino is Coming But When? After nearly 2 months of stable weather, a strong storm for this time of year, has moved into our area and is bringing some very welcome precipitation. Back in the beginning of April, our La Nina conditions died and moved into ENSO-neutral conditions. That brought on our very stable weather until this storm. Does this mean another weather pattern change could be upon us? In a word no. Our weather will quickly recover and become stable again gradually getting warmer as summer approaches. I believe this summer will bring above average temperatures. We cannot have below average precip because we average nearly no precip in the months of June, July and August combined. Again, my day job has prevented me studying the weather patterns. My apologies. Things should settle down in the coming months, I hope!